SHOWCASING spectacular living and entertaining spaces, this magnificent residence has been superbly designed to deliver a contemporary family home of substance and style. Set on a private 2219sq m parcel, manicured lawns and landscaped gardens frame the driveway leading up the side of the home, enhancing the sense of grandeur from its commanding, elevated position. Displaying immaculate presentation, the timber floors and crisp, neutral interiors present a warm, welcoming ambience. To the right of the feature glass door entry, the master bedroom boasts a luxury ensuite and walk-in-robe. Enjoying good separation, the two additional bedrooms with access to the outdoor deck are located opposite a generous casual living room/children's retreat. A deluxe family bathroom with quality fittings, feature niches and free-standing bath is located adjacent to the guest w/c. High raked ceilings and extensive use of glass create an uplifting sense of space in the light-filled living and dining areas. 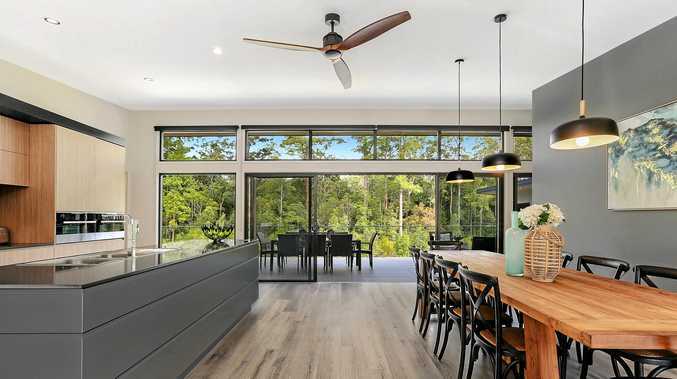 A full wall of glass sliders enhances the indoor/outdoor lifestyle of this breathtaking entertainment space by allowing effortless connection to the vast outdoor alfresco, with views over the undulating front yard and bush reserve. The gourmet kitchen, with Essastone bench tops and soft-close cabinetry, displays a full suite of Electrolux appliances, including a steamer oven and induction microwave oven and butlers pantry with ample space for functional family living. An oversized laundry is conveniently tucked away and provides abundant storage options and an integrated ironing station. To the rear of the property, an air-conditioned self-contained granny flat with kitchenette, living room and ensuite provides dual living capability. A separate executive office also adjoins a powered two-bay work shed with plentiful off-street parking and storage. Located in sought-after Palmview Forest, this builders own home offers the space and serenity of semi-acerage living, just minutes from schools, amenities and local beaches.